During Lisa Sigal’s fourth solo exhibition at Frederieke Taylor Gallery, two walls of the main space appeared to have gaping holes, outlined in blue painter’s tape, that exposed stacks of wooden beams. In the back gallery, Sheetrock boards, painted light blue, framed what looked like an opening onto the building’s brick infrastructure. Initially suggesting an ill-timed gallery renovation, these details were in fact part of works on view (That Wood Piece [all works 2007] and Two Shades, respectively). The wooden beams were not underneath but screwed onto the wall, the brick merely a trompe l’oeil wallpaper pattern. 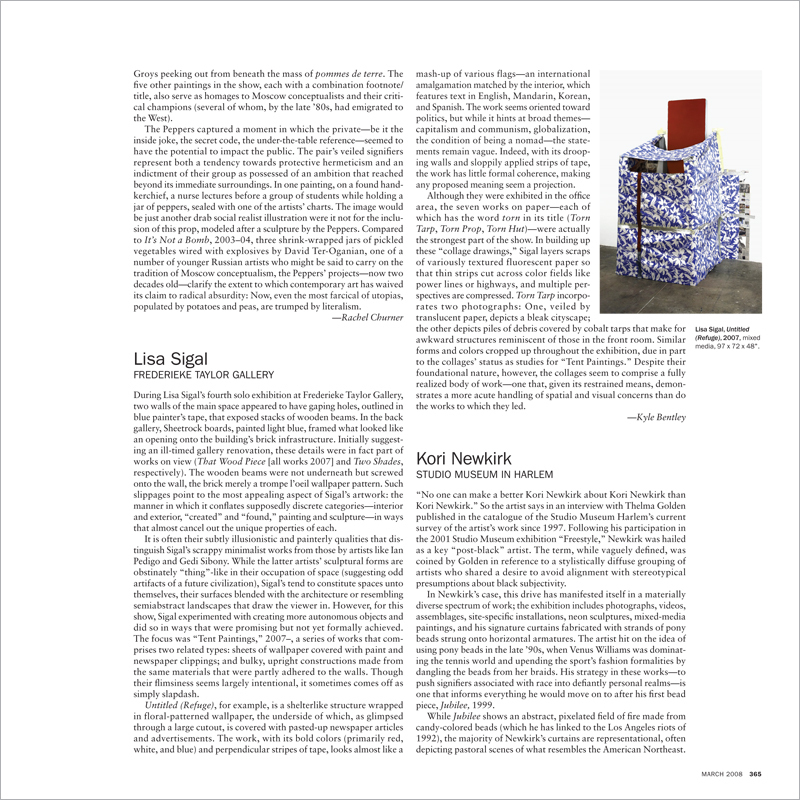 Such slippages point to the most appealing aspect of Sigal’s artwork: the manner in which it conflates supposedly discrete categories—interior and exterior, “created” and “found,” painting and sculpture—in ways that almost cancel out the unique properties of each.